Whisk together all of the dressing ingredients until combined. Set aside. Prepare an ice bath, which you'll need for cooking the asparagus, by filling a bowl with cold water and ice. Bring a large pot of water to a boil. Add a generous pinch of salt, 2-3 teaspoons, to the water. Once the water is boiling add in the asparagus. Cook for 1-2 minutes until the asparagus is cooked, but still slightly crisp. Remove the asparagus and plunge them immediately into the ice bath. Let sit in the ice bath for 5 minutes then drain and pat dry. Add the pasta into the boiling water (I use the same water that I cooked the asparagus in) and cook according to package directions. Strain pasta and immediately rinse with cold water to cool the noodles down. 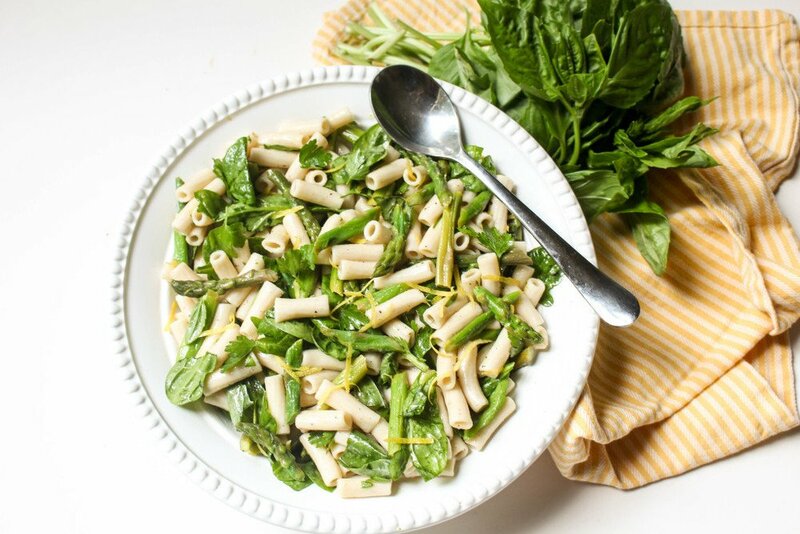 Combine the asparagus, noodles, basil, spinach and dressing. Toss to combine and serve.